Honey Sriracha BBQ Wings are better than deep fried and finger-licking good! 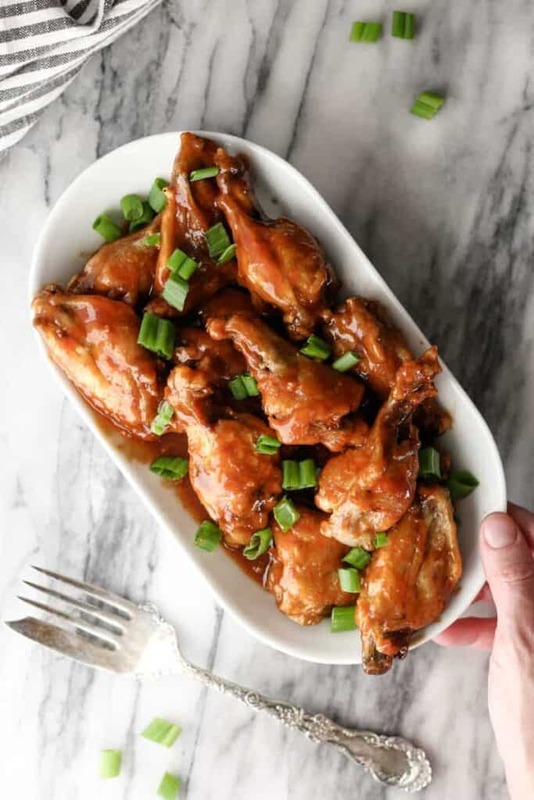 Try this Instant Pot to air fryer method for the best at home wings! Do you love chicken wings? Me too! Do you want an easy, foolproof method for making them at home?! These Honey Sriracha BBQ Wings are the best at home wings you’ll ever make! They might even be better than take-out. It’s no secret that I like to hop on whatever kitchen trend train that rolls past my house. I’ve got the Instant Pot. I’ve got an air fryer. If you’re like me and you also like to collect kitchen gadgets, then you’re in luck because you’ve got the perfect tools to make the perfect wings. 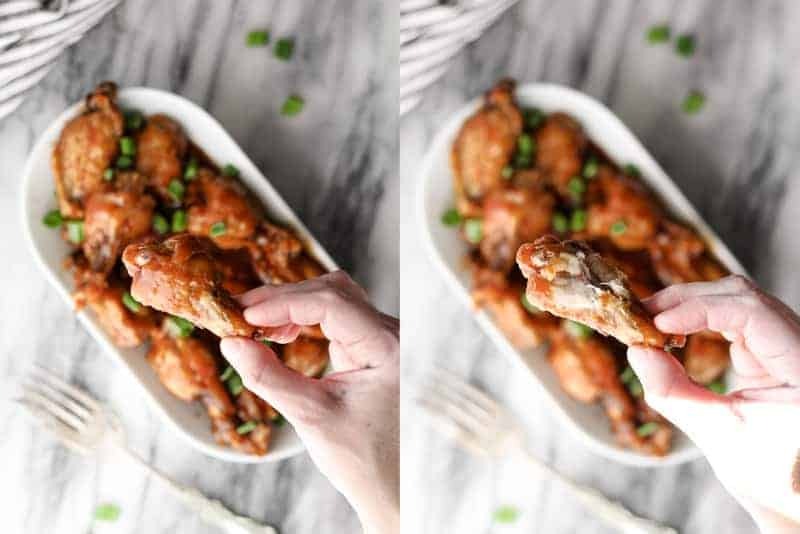 These wings go from Instant Pot to air fryer and it really does make the ultimate wing! They are fall off the bone tender from the Instant Pot with a crispy skin thanks to the air fryer! Then just toss the wings in your favorite sauce: buffalo, garlic-parmesan, or might I recommend my super tasty Honey Sriracha BBQ sauce? You’ll be in wing heaven! 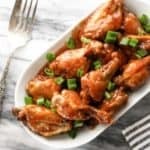 Why the Instant Pot to Air Fryer Method for Chicken Wings? Have you ever made wings at home? It’s kind of a pain in the tush. You can deep fry them, but all that oil? No thanks on that mess! Then there’s always baking them in the oven, but they never get quite crisp. They never get quite like take-out. Let’s face it, they never get good. Ok, there I said it. So then, there’s the air fryer… which on it’s own can do an awesome job at cooking wings! Buuuut the wings render out so much fat while they’re cooking that if you have smoke detectors in your house… well let’s just say you’re going to find out if the batteries are working. So it works and they’re good, BUT if you’ve got an Instant Pot and and air fryer… now we’re on to something. 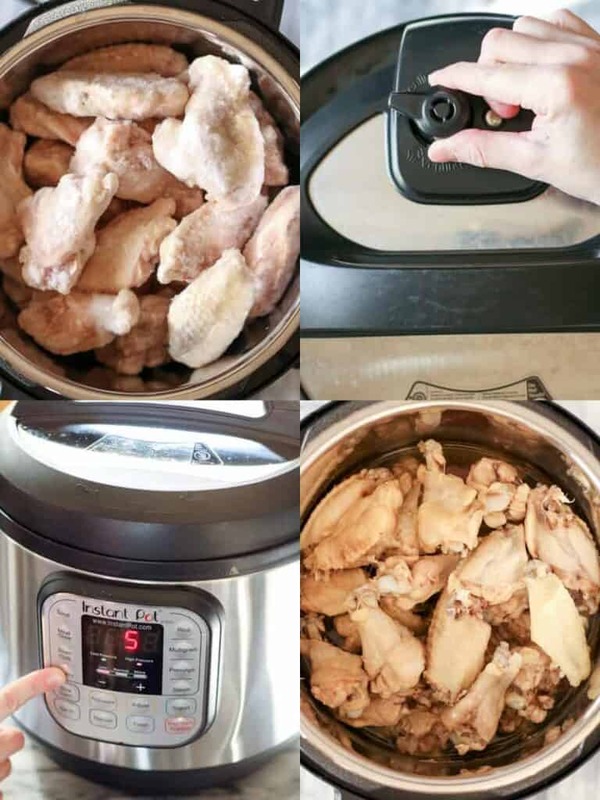 The logic is to cook the wings in the Instant Pot Pressure Cooker (affiliate link) first to render out a lot of the fat. Then pop the wings in the air fryer to crisp up the skin. I use and love this Philips Air Fryer (affiliate link). Starting with the Instant Pot will eliminate much of that fatty mess in the bottom of the air fryer so it won’t set off the smoke detectors, but the air fryer will still be able to get the skin nice and crispy! Just as if they were deep fried. 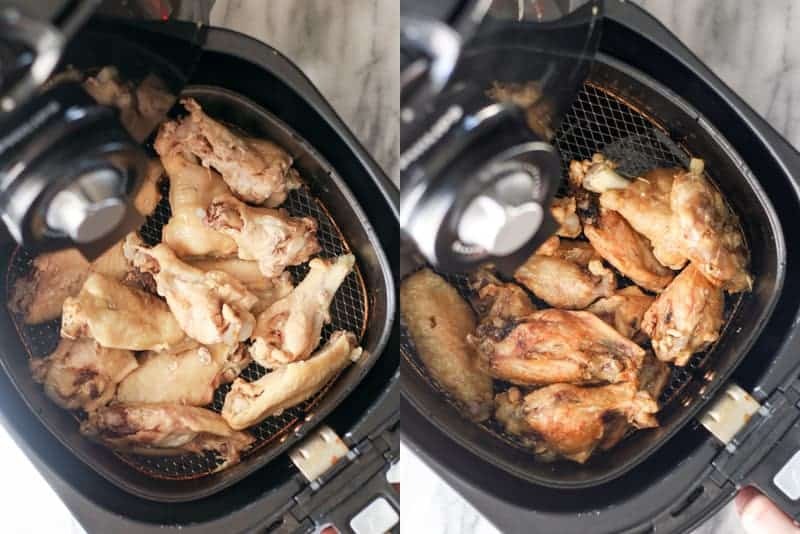 Speaking of crispy… the other reason I love using the air fryer is because you can make crispy wings without flour, cornstarch, baking powder, or any of the other coating methods people use to try and make wings crispy. That means they’re naturally gluten-free! 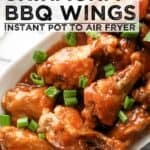 I went a’googlin’ before I made these to find out the basic times for making wings in the instant pot first then transferring to them air fryer. I mean surely someone has done it because everyone has done everything. Nothing is really original these days, but I digress. I came across this Lifesaver BBQ Pressure Cooker Chicken Wings Recipe from pressurecookrecipes.com, which is what I used as a reference for this recipe. First put the trivet in the Instant Pot liner and then the wings on top. Put the lid on and turn to sealing. Set to Manual or Poultry for 5 min. After a 10-15 min natural release (NPR), flip the valve to venting and remove the lid. Not waiting for them to thaw means that when the craving hits you can have wings in the same amount of time that it would take to order carry-out. Less mess during the thawing process since you don’t have to worry about leaks or bowls to thaw them in or clear a space in the fridge. The frozen wings save time and mess in other ways, too. They come pre-portioned while the fresh wings are usually whole. Whole, fresh wings would need to be cut into the drummette, wingette, and tip (which is discarded). If you ask me… frozen is obviously the way to go! Remove the wings from the Instant Pot and let any excess liquid drip off. Place the wings in the air fryer basket. I have a pretty small air fryer and I can fit about 2 lbs worth of chicken pieces in my basket. Cook in batches if making more than two pounds. Set the air fryer to 400° and cook for 10-15 min, shaking them occasionally. Cook the wings until they reach your desired crispiness. That’s it… now it’s time for sauce! BBQ sauce: use your favorite kind but mine is a sweet and thick sauce. Sriracha Hot Sauce: found in the condiment aisle or asian aisle. To make the sauce, just mix all the ingredients together in a small bowl and set aside! Super easy! 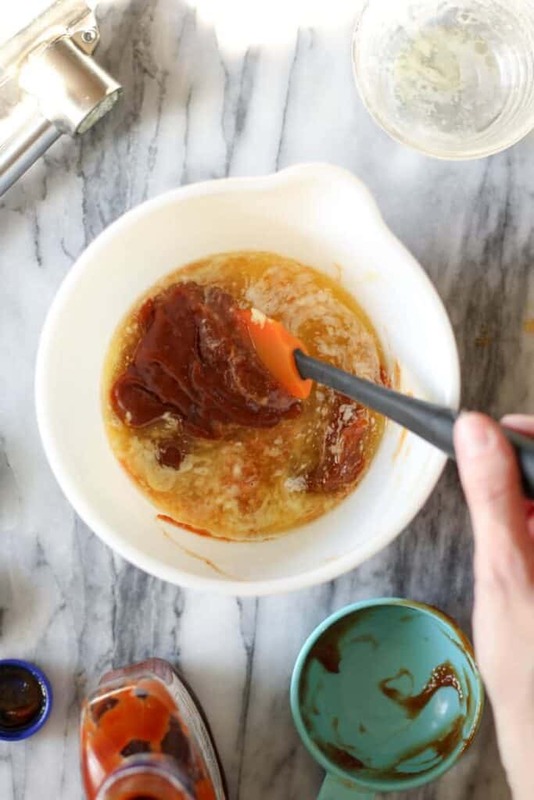 Ideally, you would mix the sauce together at some point while the wings are cooking. Immediately after the wings come out of the air fryer, toss them in the sauce and serve. 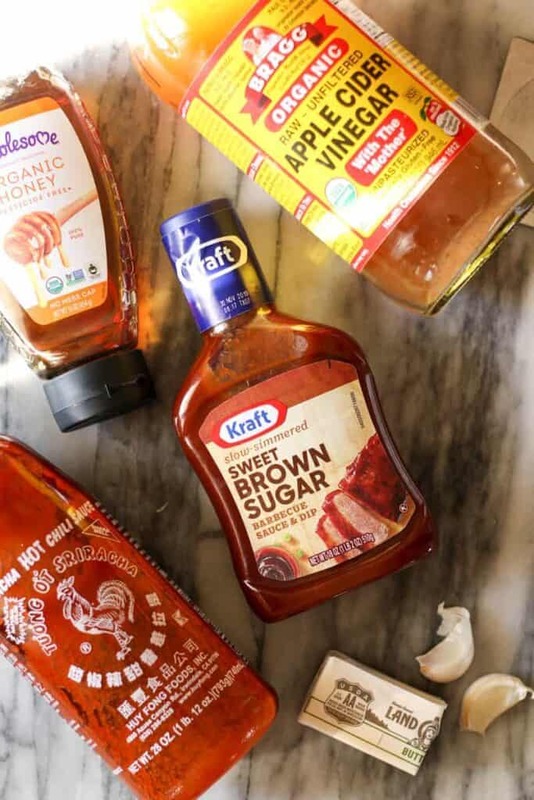 I obviously recommend trying this Honey Sriracha BBQ Sauce but you can absolutely toss the wings in your favorite sauce, be it buffalo wing sauce, garlic butter and parmesan, or even plain barbecue sauce. Mix all sauce ingredients together in a small bowl. Set aside. Place the trivet into the instant pot liner. Pour in 1 cup of water. Place the chicken wings on top of the trivet. Put the lid on the Instant Pot and turn the valve to sealing. Press the Poultry or Manual button and adjust the time to 5 min. When the time is up allow for a 10-15 NPR (natural pressure release) before turning the valve to venting. Remove the wings from the Instant Pot and let any excess liquid drip off. Place the wings into the air fryer basket. Set the air fryer to 400° and cook for 10-15 min, shaking the basket a couple of times throughout cooking. 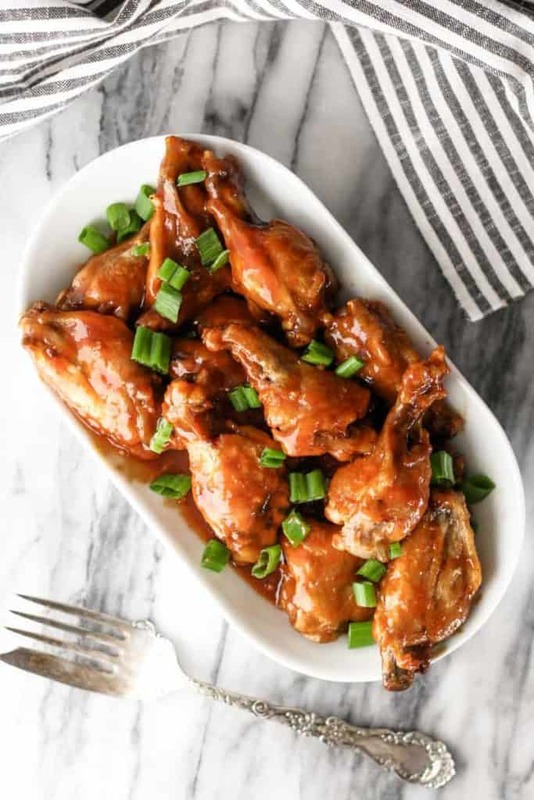 Once the wings are light golden brown, remove them from the air fryer and immediately toss in the Honey Sriracha BBQ Sauce. Serve immediately. Pre-cook the wings in the instant pot a day in advance and keep refrigerated until ready to air fry. 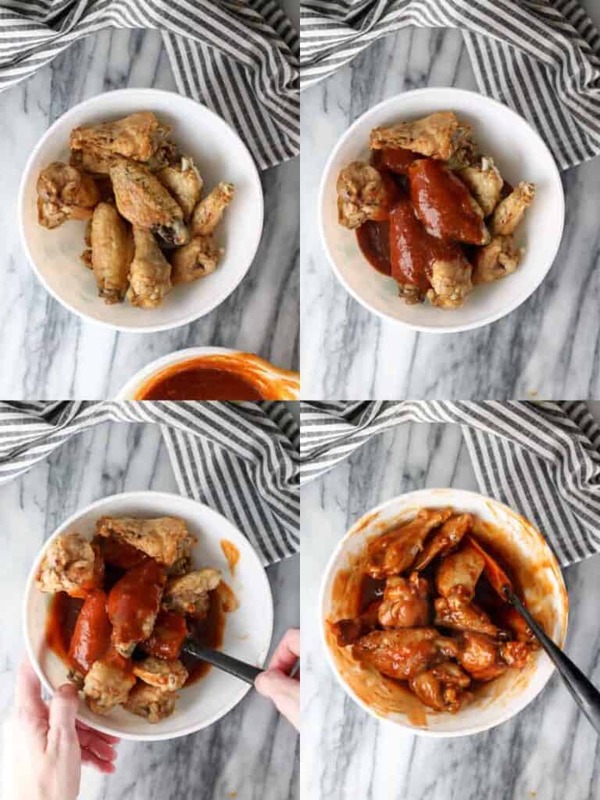 You can use fully frozen or fresh wings in the Instant Pot step. I’m totally converted. This is by far the most foolproof method I’ve found for making wings at home. Cleanup is easy, the wings taste just as good if not better than take-out and the sauce… Oh, this sauce is so good! The only negative is how accessible it is to make wings now! It’s almost too easy to say… “Hey let’s have some wings tonight!” Which I suppose isn’t really all that bad since they aren’t deep fried. These wings are certainly healthier in that regard! Wouldn’t these wings be perfect for a game day party?? You can bet that these will be on my Super Bowl Party Menu! I may also have to make this Chipotle Chicken Chili for game day too!